Warning: this installation documentation is for Netmagis version 2.1.x, which is an old version of Netmagis. if you are installing from a previous version of Netmagis, you should rather read upgrade instructions. common This package is mandatory for all installations. It includes common library file and configuration file example. database Database server (maintenance and installation scripts, as well as scripts to upgrade database from previous versions). www Web application (CGI scripts, HTML templates, Apache configuration files, etc.). servers Scripts running on various servers (DNS, DHCP, mail router). utils Scripts to ease batch modifications of hosts in the database. detecteq Set of files or programs to detect configuration modifications on network equipments. This package must be installed on your central syslog server (for Cisco and Juniper equipments) and your central Freeradius server (for HP equipments). This package is needed if you plan to run the topo package. topo Backend used to fetch configuration data from network equipments, modelize topology in a graph, and optionnaly inject new ports configuration to equipements. In order to run properly, this package needs to know when a modification of configuration is done on any network equipment. This is the role of the detecteq package. metro Backend used to poll equipments for metrology information. Packages are designed such as they may be installed on one unique server as well as each on its dedicated server, depending on your security requirements, performance considerations or site specificities. on the opposite, a small site may wish to run all packages on a unique virtual server. The www and the topo packages must be installed on the same architecture (CPU and OS), even if the servers are physically distinct. At this time, the supported way to install Netmagis is via FreeBSD ports, which are provided in a separate archive (file netmagis-freebsd-ports-*.tar.gz associated with appropriate netmagis version). The provided ports automatically install required dependencies. If you are using an Ubuntu distribution, check that the "universe" section is enabled in /etc/apt/sources.list. Since packages are not signed, you must manually answer "Yes" to the question "Install these packages without verification?". Install required dependencies. Please note that Tcl is a required dependency for all packages. That's it! You may now proceed to initial configuration. On the host where you installed the database package, you should have a PostgreSQL server. The recommanded version is at least 9.1. Even if you want to use a different database for the mac package, you can use the same user. The Netmagis configuration file is located in .../etc/netmagis.conf on each host where Netmagis is installed. The common package does not install this file (in order to leave your file intact if you previousely installed Netmagis), but it installs a copy in .../etc/netmagis.conf.sample. Copy it manually to .../etc/netmagis.conf, and edit it. The following table list only directives you would want to modify for a fresh installation. dnsdb... Information needed to connect to the PostgreSQL server, with an unprivileged user (see below). macdb... Information needed to connect to the PostgreSQL server for the mac package, with an unprivileged user. If you don't want to use a separate database, or if you don't want to use the mac package, use exactly the same values as for the the dnsdb... parameters. whoami Command used to get login name of the user who is running the current program. It should display exclusively the login name. Default value is suitable for FreeBSD and Ubuntu. rootusers Login names of Netmagis users allowed to access the application even when it is in "maintenance mode". You can now proceed to database installation. dbcopy Name of a copy of the Netmagis database, generated every night (see the netmagis-dbmaint program in the database package). This copy lets you experiment and work on data without fear. If this directive is empty, the maintenance command will not create a copy of the database. If you are upgrading from a previous WebDNS or Netmagis installation, please see the upgrade instructions. Users are created in the Netmagis database, including the internal authentication schema. if you use an LDAP authentication, rootusers users should exist in your LDAP directory. Unless you are upgrading from previous versions, you should import your data into the database. Doing so is described in the section below. You can later destroy and re-create the database with your own data. Install the sample crontab (.../share/examples/netmagis/crontab.database) in your default cron system. This crontab can be run by any unprivileged user. FreeBSD users: if you install this crontab in the global /etc/crontab, please provide a user name just before the command name. Netmagis database is now installed. You may now install the www package. To store user accounts, the Web application can use either an existing external LDAP directory or the internal PostgreSQL database. passwdurl URL which should be displayed to let users change their password, if you use an external LDAP authentication. Leave empty if you use internal PostgreSQL authentication. A default Apache configuration file is provided in ..../share/examples/netmagis/httpd.conf. Adapt this file and include it in your Apache configuration. If you are using an external LDAP directory to authenticate your users, copy the sample Apache configuration file provided in .../share/examples/netmagis/auth-ldap.conf in your Apache configuration directory, adapt it to your local configuration. Next, copy the sample Apache configuration file provided in .../share/examples/netmagis/auth-pgsql.conf in your Apache configuration directory, adapt it to your local configuration. Check the Auth_PG_host, Auth_PG_port, Auth_PG_database, Auth_PG_user and Auth_PG_pwd configuration lines. Direct now your Web browser to the http://yourhost/netmagis/index, and connect with your login name. If you use the internal Netmagis PostgreSQL authentication, use the password generated by the netmagis-dbcreate command, during the database creation phase. You should see a main menu such as this one. If you are using LDAP or CAS authentication, go into the Admin menu (on the left vertical bar), then to the Application parameters menu. In the "LDAP authentication parameters" section, adapt values to your LDAP directory. Then select the LDAP item in the Authentication method menu (in the "General parameters" section). Then, click on the Submit button to register your new configuration. Select any item in the left menu to check that your authentication parameters are correctly configured. If you are using internal Netmagis authentication, change your password (unless you want to keep the generated one...). Change also your name (as well as other account informations) with the Admin / Internal Auth / Modify account menu. Congratulations! The Web application is now installed. Your next task is to feed your database with referential data (users, groups, networks, etc.) as well as your existing DNS zones if any. Documentation about common tasks in Netmagis configuration is provided in a separate page. The utils package is optional: it contains commands to add, delete or modify individual hosts, as well as DNS zone prologues. These commands are designed to be used wth the Unix shell. Installation is very simple: only common netmagis.conf directives to connect to the database are needed. Notice, however, that this file (including password to connect to the database) must be readable to all users of these scripts. This may be a security risk if you make this file readable for all users, but you can also control access to the configuration file and to the scripts based on a group policy. dnsaddalias fqdn-alias fqdn-host: adds the specified alias to an existing host. dnsdelip addr: deletes an IP address. If this is the last, deletes the host. droitsmtp: value is 0 to remove the right to emit mail with unauthenticated SMTP, or 1 to add the right. dnsreadprol zone: displays on standard output the DNS zone prologue specified by its domain name. dnswriteprol zone file: use the named file as the zone prologue. Since this operation may have a great impact, manual confirmation is required. Note that users using this script must have a Netmagis account with the same login as the Unix one. The servers package must be installed on your main BIND server, on your DHCP server, and on your mail router, depending on the features you want. diff Command line used to signal differences between two versions of a server file (DNS zones, DHCP files, etc.). zonecmd Command used to make your DNS daemon reload the generated zone files. The default command is for BIND 9.x. Please note that if this command fails, zone generation is aborted and old zone files are restored. If you have configured a cluster of name servers, you can use this directive to propagate inforamtion to other nodes. This command tests zone generation, without performing any file modification. You can force generation of some zones by using the Admin / Force zone generation. This sets a flag in the dns.zone SQL table, which is read by the mkzone to find modified zones. If everything is ok, you can use the sample .../share/examples/netmagis/crontab.bind to install the periodic zone generation for the user. Remember that the SOA serial number is limited to 2 digits (i.e. 99 modifications by day), so there is no more than 4 modifications by hour on average (over 24 hours). 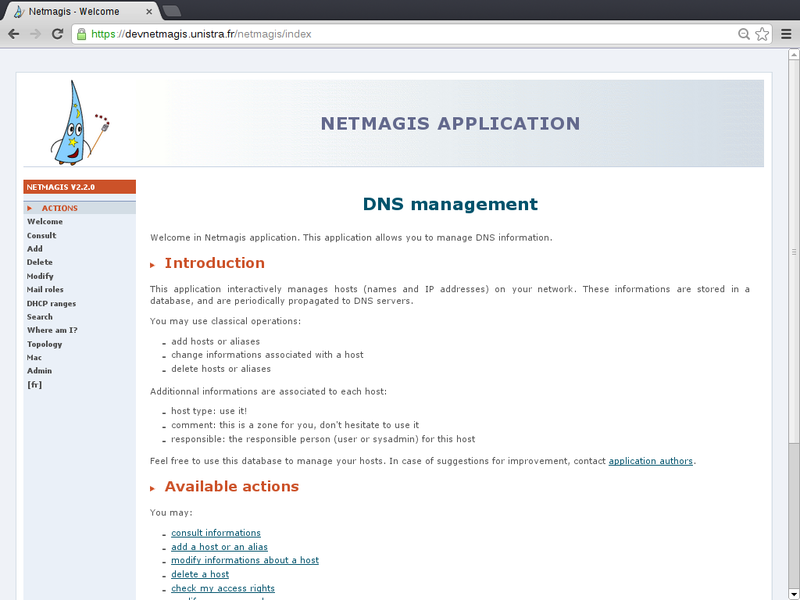 Netmagis is designed to aliment a central ISC DHCP server. If you want to use this functionnality on other networks, you need to activate DHCP relay in your router configurations. The Netmagis can also handle failover configuration in order to provide a redundant DHCP service based on 2 ISC DHCP servers. Note: if you don't plan to use DHCP generation, don't panic! This directive (and the next ones) will not be used. dhcpfailover Line to add to generated pools if you use ISC DHCP failover feature (DHCP redundancy over 2 servers). Leave empty if you don't use this feature. dhcptest Command used to check DHCP configuration file before restarting ISC dhcpd daemon. This is needed since Netmagis administrators may add faulty DHCP profiles, and ISC dhcpd daemon is not very tolerant to configuration errors. Please note that this command contains the location of your main teletype dhcpd.conf file. dhcpcmd Command used to make your ISC dhpcd daemon reload the configuration. This command tests DHCP file generation, without performing any file modification. If everything is ok, you can use the sample .../share/examples/netmagis/crontab.dhcp to install the periodic DHCP file generation. You should run the DHCP file generation soon after the DNS zone generation (such that new host names are not generated in DHCP file before they are known in the DNS). Netmagis can be used to generate mail routes for you central mail router. Routes are generated following "mail roles", whose modifications are enabled individually for each allowed domain in the Admin / Modify users and groups menu. which means that mail addressed to someone@specific.domain.com is to be sent to host host.domain.com. Note: if you don't plan to use mail route generation, don't panic! This directive (and the next ones) will not be used. mrouteprologue Prologue of the generated mail route file. This prologue allows you to mention specific mail route information which cannot be extracted from the database. mroutefmt Format of mail route entries: %1$s is the mail address and %2$s is the host accepting mails for this address. mroutecmd Command used to make your Sendmail daemon reload the generated route file. If your mail router is a cluster of hosts, this command will have to propagate the file and restart the daemon on other nodes. This command tests mail routes file generation, without performing any file modification. If everything is ok, you can use the sample .../share/examples/netmagis/crontab.mroute to install the periodic file generation. If you use authenticated SMTP, you know than some hosts (copiers, embedded measurement machines, etc.) may not be able to use authenticated SMTP. Some exceptions must be done. Netmagis helps you handle these exceptions, by providing a special flag to each host. Right to activate this flag is enabled for each group in the Admin / Modify users and groups menu. Your mail submissions hosts accept connections on port 25 only from authorized hosts. A configuration file for a *BSD PF (packet filter) is provided as an example in .../share/examples/netmagis/pf.conf.sample. You will notice that the smtpf table is read from a file, generated by Netmagis. pffile File where the PF packet filter (on *BSD hosts) expects to find the contents of the table giving IP addresses of hosts allowed to use unauthenticated SMTP, i.e. hosts allowed to connect to TCP port 25. Note: if you don't plan to use Netmagis to control which hosts have access to unauthenticated SMTP, don't panic! This directive (and the next ones) will not be used. This command tests filter file generation, without performing any file modification. If everything is ok, you can use the sample .../share/examples/netmagis/crontab.smtpf to install the periodic file generation. Congratulations! You have installed the servers package. The Netmagis is ready to be used, for its core functionnality. radius accounting for HP equipements. In this case, since HP equipments are unable to report configuration changes via Syslog, the hack is based on Radius accounting which detects user logout (which do not strictly imply a configuration change). Thus, the detecteq package must be installed on your central syslog (syslog, syslog-ng, etc.) server and/or your central radius server, depending on your equipments. Since modification events are sent to the database, the detecteq package does not need to be installed on the same server as the topo server. In order to automate configuration fetching from a central server, a unique user should be defined on every network equipment. Let us call it conf. This user should have the right to execute the show configuration commmand (or similar), which means it must have the "admin" privilege. Moreover, at least on HP equipments, there should be another distinct user (let us call it modconf) which should be able to modify the configuration in order to change interface characteristics. This second user is needed for Radius to distinguish regular configuration fetching from configuration modification. Adapt this line to your syslog facility and the detecteq installation path. You can also use other syslog daemons such as syslog-ng if they provide the "pipe to program" functionnality. Configure your existing Freeradius using the SQL accounting module and the example files provided in .../share/examples/netmagis/radius/ directory. TO BE WRITTEN: explain in detail this installation. As described above, the Radius accounting server needs to distinguish regular configuration fetching from configuration modification. This is done using the topo.ignoreequsers table which contains login names of the users to ignore. One of the most innovative parts of Netmagis is the topo package, which provides a complete infrastructure to fetch and analyze network equipments configuration files and modelize the network as a graph. This allows for automatic generation of network L2 and L3 maps, equipment port configuration, as well as interactions with the metrology package. At this time, Juniper, Cisco and HP equipments (switches and routers) are supported. You have the choice to run the topo and www packages on the same host or on distinct hosts. For security reasons, one would often use a separate server to run the topo package. This server should be located within the administration VLAN of equipments, if you have one. the ability for the www package to access data extracted from the network graph built on the topo server: the topo server pushes (via a SSH connection) the file containing the built graph, and the www server runs extract commands on demand. This means that the topo package must also be installed on the www server to provide these commands. This also means that the architecture of the two servers must be compatible (CPU and OS) since the graph is a binary file. The rest of this section describes the topo package installation. The first part is the configuration of the topo server. The first step of installation is to configure the rancid software (prerequisite of the topo package) on the topo server. Choose a unique "group" name for all your network equipments. The topo package uses the name mygroup by default. The name must be configured in the file rancid.conf (location is system dependant), in the line beginning with LIST_OF_GROUPS. While you are here, notice the BASEDIR directory name. Configure a mail alias rancid-groupname (in /etc/aliases or equivalent, don't forget to run the command newaliases or equivalent) to receive notifications when rancid detects modifications. See the cloginrc(5) manual page for details about this configuration file. Be sure that this file belongs to the rancid user and has mode 0600. This program is located in /usr/local/libexec/rancid/rancid-cvs on FreeBSD and in /usr/lib/rancid/bin/rancid-cvs on Linux (Debian/Ubuntu). In order to test your rancid installation, name some equipments in the router.db file, which should be located in $BASEDIR/group-name/router.db. See the rancid README for instructions. This file will be overwritten by the topo package with information from the Netmagis database. The test is ok if you received a mail with the equipment configuration, which is also stored in the $BASEDIR/group-name/configs/ directory. The rancid README says to run rancid-run periocally with cron. Do not do this: the topo package will call rancid when needed. Notice: this is not related to Netmagis installation, but you should consider installing a Web interface to CVS (CVSWeb) to ease tracking of your equipement configuration history. You are advised to use the Web application (Topo / Link number menu item) to get and register link numbers. This way, you keep track of used link numbers, and link numbers are ensured to be unique. A complete description of the topo configuration is available on a separate page. sendcisco, sendhp, sendjuniper Commands used to propagate new port configuration on an equipment, if you choose to enable the functionnality of letting users modify interface configuration. topocpgraph Parameters (user@host:remote-path) used to copy the graph built during topo analysis to the www server. Leave empty if the topo and www servers are the same host. You will undoubtly notice a large number of warning that you will correct with time. If no fatal error has been encountered, you will normally find in .../var/netmagis/network.graph the modelization of your network. This is a binary file. Be sure that the detecteq package is properly installed on your central syslog server and/or your central radius server. If you have choosen to install the topo and www packages on different servers, you have to configure the SSH connection from the rancid user on the topo server to a user on the www server. This SSH connection is used to copy the network graph computed by the rancid user on the topo server to the www server. The destination user on the www server will own the copied graph, which must be readable by the CGI scripts running under the Apache user. This destination user may be, for example, the Apache user (called www, www-data, nobody, etc., see the "User" directive in Apache configuration files). Let us call it the w user. Make sure this w user (on the www server) has a home directory and a valid shell. Copy the public key (˜rancid/.ssh/id_rsa.pub) to the ˜w/.ssh/authorized_keys on the www server. Warning: the path supplied here is the path of the graph on the server, which should match the topograph directive on the www server. If you have choosen to install the topo and www packages on the same server, make sure that the topocpgraph directive is empty. You need now to come back to the server which hosts the Web application. topograph Path name of the graph copied onto the www server. change the "Topo mail sender" value: you may use an invalid address such as automatic mails generated by the topo server don't receive replies. change the "Topo mail receiver" value: topo mails will be sent to this address rather than to the genuine rancid-groupname alias you've previousely defined. After activation of the topo package, you will see a new Topology entry in the left menu. Make sure that all your network equipments (and the default domain) exist as hosts (and domain) in the Netmagis database. Input your network equipments (as fully qualified domain names) and your VLANs via the Admin / Modify equipments and Modify Vlans menus. You can monitor the topographd and toposendd daemons with the Admin / Topod status menu. If you want users to be able to modify interface configuration within the Web application, enter the Admin / Modify users and groups menu, and input regular expressions in the Permissions on network equipments section. The Topo configuration documentation has all information to complete the Topo configuration. Congratulations! You've configured the topo package. You can now consult your equipments, your network maps, and even modify interfaces of your equipments if you enabled this feature! At this time, all kinds of equipments are supported for traffic and ip/mac collection, provided they run a standard SNMP MIB-2 agent. For port/mac collection, Cisco, Juniper and HP equipements are supported. metrocreatedb which creates metrology sensors based on the metrology collection points defined in the Netmagis database, resulting from equipement configuration fetching by the topo package. The first part of this section describes the configuration of the metro package. rrddb Directory where rrdtool databases are stored. Reserve enough disk space for this directory. It is usually a sub-directory of metrodatadir but it can be a separate directory if you need more disk space. sensorsurvival Grace period (in days) before sensor removal. This is needed when a sensor is no longer updated by topo (this can be caused by a volontary removal or a bad configuration of the equipment). So for safety reasons, the polling is really stopped on this sensor only after this grace period. pollergroups FIXME: provide description of directive first, and explanation after. We recommand to start with the grouping provided in the default configuration and refine the configuration afterwards. You must declare all your groups with the directive "pollergroups". Names of the different groups are separated by a ",". gpopt_<pollergroupname> The gpopt_* directives define which sensor types are associated with each group defined with the directive "pollergroups". If no sensor type is specified, all sensor types will be executed by the poller group. If you want that a poller group collects only some of sensor types, write the list of type names separated by a "," to the "gpopt_GROUP" directive. If you want that a poller group collects all sensor types except "ipmac" and "portmac.cisco", write a "!" before each type name of sensor separated by a "," to the "gpopt_GROUP" directive. gpnbproc_<pollergroupname> Set the number of processes launched simultaneously for each poller group. The data collection task is shared between the different processes which run in parallel. You can raise the number of processes to reduce the total execution time for all sensors. ifspeed_<ifaceprefixname> Set the speed (in Mbit/s) associated to the prefix name of an interface type. This configuration is useful to tune the maximum values of rrd databases when the SNMP ifspeed values collected on the interfaces are not reliable. will limit the maximum speed for all interfaces called "Dot11Radio..."	(cisco Aironet radio interface) to 300 Mb/s. metrohost Set to the server name hosting the metro package ; if metro is installed on the same server as the www package set it to "localhost". Activate the creation of new sensors and collection of data. For this, you must create a user that will run all the metro programs and make this user the owner of all the metrodatadir and rrddir directory trees. Let us call this user m.
Install the sample crontab (.../share/examples/netmagis/crontab.metro) in your default cron system. This crontab should be run by the user m.
After the fisrt execution of .../bin/metrocreatedb, polling can start. Allow access from the www server to the metro webservice: NB: the www host must be trusted by the metro server. The access to the webservice is not authentified. Copy the file .../share/examples/apache-metro.conf to your apache configuration directory and adapt it to your environment. The line starting with Allow from must have the IP address of the server running the www package. If www and metro both run on the same host, just put localhost. To activate a traffic sensor on an equipment interface, the only thing to do is to add information in the interface description on the equipment, as you have done with topo package. This information is the string M concatened with the name of the sensor. You can use any unique name for a sensor. For example, Netmagis authors use the link number (used with the topo package) associated with the name of the equipement (since a link number is present on each end of the link), but you can use your own convention. name "core link <L233 M233.eqname>"
name "edge port <X Meqname.desc>"
To collect ip-mac and port-mac session, you need to enable the mac package in the application configuration in the Admin web interface. To activate an ipmac sensor in your equipement configuration, you have to add information in the SNMP sysLocation description. This information is just the letter I, bracketed with "<" and ">" added to syslocation string. Important: The sensor works only if routing is enabled. HP snmp-server location "I'm here <I>"
To activate a portmac sensor in your equipement configuration, it is the same process is an ipmac sensor; just use <P> (instead of <I>). Important note: if you want activate both ipmac and portmac sensors on the same equipment, insert the string "<I P> in the sysLocation description. metro.sensor : list of parameters of all sensors for data collection. This file is generated automatically by metrocreadb. metro.quarantine : lists all the sensors which are no longer updated by topo. The sensors are definitively removed after a grace period. metro.plugins : this file is reserved to be manually updated in order to execute plugins or sensors which are not automaticaly activated. The rrdtool databases are stored in this directory. You can find in this log file all the messages generated by sensors collection and plugins execution. All the informations about the creation, deletion of sensors are in this log file. This directory contains the results of the ipmac and portmac collection before storing them in the mac database. This directory contains the caches files created by the sensors collection. By example, the (ip,interface name,SNMP interface index) relation. This Directory contains the locks files created by some scripts (metrocreatedb, plugin-ipmac or plugin-portmac) in order to avoid multiple executions of the same script in the same time. Important : If a crash of a script occurs, the lock file must be removed.